jBPM is lightweight, fully open-source and written in Java language. jBPM focuses on BPMN 2.0 (Business Process Model and Notification) specification as the process definition language. BPMN 2.0 is a global standard for process modelling and is one of the core components of successful Business-IT-Alignment. 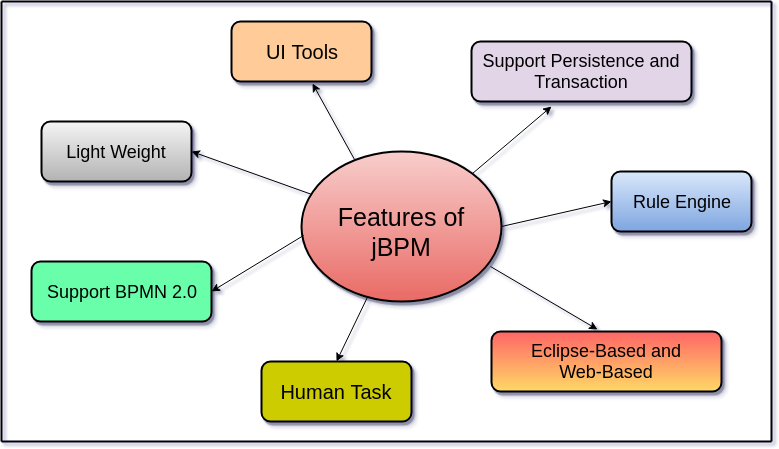 jBPM supports Persistence and Transactions which is based on the JPA and JTA. jBPM has UI tools available in the design phase. jBPM works on Eclipse-based and Web-Based editor which provides drag and drop support for the graphical creation and simulation of our business processes. jBPM provides a Rule Engine which provides a declarative language that is used to evaluate the available information. jBPM uses a pluggable Human Task Service based on the Web Services Human Task specification. It includes tasks that need to be performed by humans. It also defines the data structure to store information about the human tasks.